MoviePlus X6 is among the best video editing software that is available in the market. It offers wizards to amateur users to create movies quickly. Professional video makers can take use of this software’s advanced video editing tools and numerous editing tracks. In case you wish to create a movie without spending a lot of time, then you can use QuickMovie tool. This editor wizard helps you out to compile all the elements that you wish in a themed movie. It also helps you in choosing a theme, import files, and to the ability to add a personal touch to your movie. Its tools are intuitive ad its user guide is a great resource in case you need additional help. 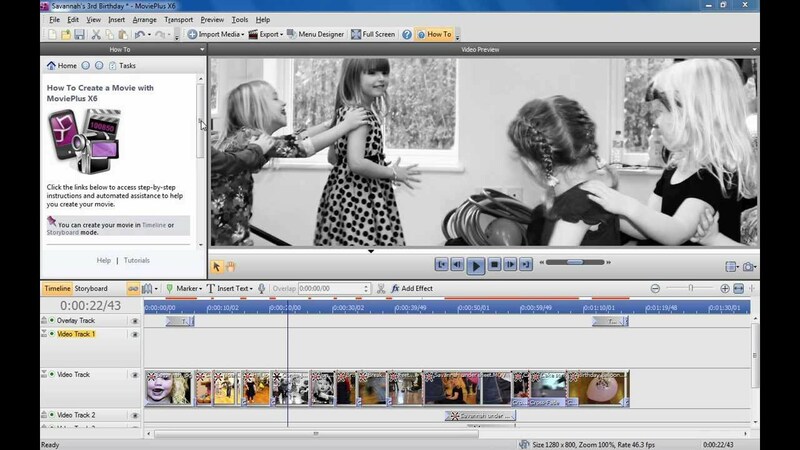 This video editor is quite useful for those who wish to learn more about best video editing software. You can easily learn common editing tools like trimming and arranging video clips on the timeline by using various templates and wizards. Then you can then move on to much more advanced tools such as chromakey, video stabilizer, and audio mixer. When you are using the full-feature editor, you get access to almost all selection of different video editing tools. This software has a library of over 200 video transitions and effects that also allow you to personalize and customize your video. When you have finished your video, MoviePlus provides many options for sharing it with your audience. You can upload your videos to various social sharing sites like YouTube, Dailymotion, Vimeo, Facebook, etc. You can also optimize your videos according to smartphones, PC, and tablets. But the sharing feature is quite less considering its competitors. This program comes with a comprehensive user guide with various links from its table of contents to specific topics which can be searched quickly. It also has telephone and email contact information on its website. This website also has links to various forums, a knowledge base, and tutorial on different video editing subjects such as color correction, basic timeline operation and using chroma key. MoviePlus X6 is a great virtual video editing training camp which is designed to teach you the basics and prepare you to use advanced tools. It also has a wide range and selection of editing tools and video effects which will help you to build a highly customized video. So, go ahead guys. Try this software and make your movies.